The ad, created by a presidential Super PAC supporting Ohio Gov. John Kasich, featured Ayotte&apos;s support for reauthorizing the law, which became contentious and political in 2012 and 2013. The Senate GOP split on the question, with Ayotte among the vocal supporters. Rubio, a Florida Republican, opposed it. The spot is largely a clip from a news conference where Ayotte joined other supporters of reauthorizing and updating the law, with the New Hampshire senator flanked by Sen. Patrick J. Leahy, D-Vt., who was chairman of the Judiciary Committee at the time. The 22 Senate Republicans who opposed the final version of the measure were all men. The ad from New Day For America surfaced online overnight. Politico reported a $1 million ad buy was to start Tuesday, highlighting Rubio&apos;s opposition to the legislation. 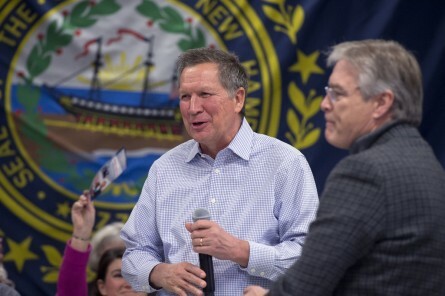 But apparently, neither the Kasich campaign nor Ayotte wanted anything to do with it. "The Violence Against Women Act provides critical resources for domestic violence prevention and support for survivors, and I worked across party lines to help renew this landmark law," Ayotte said in a statement. "This is a serious issue, and I&apos;m appalled that an outside group has exploited it in a political attack." Not long after, New Day For America announced a replacement ad that carried a much more optimistic message, called "Sunrise." "We have replaced the ad highlighting Senator Marco Rubio’s vote against the Violence Against Women Act with ‘Sunrise,’ which appropriately captures the optimism of Governor Kasich&apos;s campaign," spokeswoman Connie Wehrkamp said in a statement.